SWEATSAFE has been "protecting" active South Africans since 2008. Our brand and the service that we provide to our members are of prime importance . Our specially designed, locally made silicone or velcro bands with their unique pin number are the key to immediate identification and swift emergency care in the case of an accident. 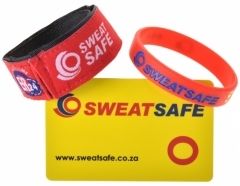 The red SWEATSAFE band is durable and highly visible. Wearing it on your person (wrist, ankle, belt, helmet) could save your life. It is imperative that your band be worn at all times so that SWEATSAFE can work for you. You also receive a SWEATSAFE membership card which displays your unique pin number together with ER24 contact details to ensure rapid, hassle-free access to private emergency and hospital services. Together with our brand partners ER24 and Constantia, we are committed to providing you with the best service possible.